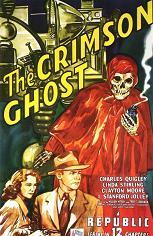 A criminal mastermind known as The Crimson Ghost is out to steal a device called the Cyclotrode, which can short-circuit all electrical current on the planet. Stars Charles Quigley, Linda Stirling, Clayton Moore and I. Stanford Jolley. Also with Kenne Duncan. Bud Geary wore the robes of the Crimson Ghost, but the voice that came out of the stationary skeletal mouth was that of I. Stanford Jolley, who was billed fourth in the cast. Another actor dubbed Jolley's character's response on the radio. Finally, a fourth actor played the Crimson Ghost's alter ego. Alcoholism and ill health (he was on prescribed medication for a stroke suffered the year before) led to the suicide of Kenne Duncan from an overdose of barbiturates on February 5th, 1972. He was 68. Duncan had made his longtime friend and drinking buddy, Z-grade writer/director Edward D. Wood Jr., the executor of his estate. After his funeral, a wake was held at Wood's swimming pool, with each of the guests reminiscing about Duncan standing on the diving board.